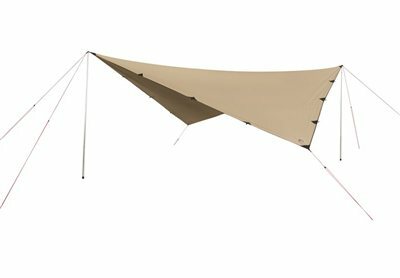 Used in conjunction with a tent or on its own, the durable Outback Tarp offers flexible fast pitching sun and rain shelter. The large 4 x 4 m tarp is a versatile performer with many potential uses beyond its primary camping focus - in the garden, for picnics and with barbecues for just a few. Used with our telescopic poles, its curved sides add a dash of style to outdoor living whilst the reinforced guying points and strong webbing loop hangers ensure stability. HydroTex® Polycotton looks great, feels great and delivers top technical performance and comfort. The durable woven fabric has a water repellent treatment which encourages rain to run off the tent walls. As the rain gets heavier, the fabric’s fibres close up to form a waterproof seal. Its UV-decay-resistance treatment helps to ensure that it will last for many years with reasonable care. This superb fabric is really appreciated by campers on sunny days as, being breathable, it helps to keep tent interiors comfortably cool compared to conventional materials. Robens Outback tents in eye-catching designs with proven technical performance make this range ideal for families and groups looking to make a lifestyle statement while enjoying the outdoor experience. User friendly and spacious, with ample headroom, Outback tents also prove durable and comfortable, using alloy poles (steel for Prospector) and our unique highly breathable HydroTex® Polycotton fabric that stabilises the tent’s inner microclimate. Time to escape modern day pressures and seek out ways to reconnect with a simpler life that captures the essence of the great outdoors through interaction with nature. Time to cook, eat and socialise around the campfire and experience the enjoyment of pure outdoor living through our Robens Outback range of tents and accessories. We have taken inspiration from those sepia pictures of early American pioneers and prospectors to bring the back-to-basics bushcraft approach to outdoor living into the present. Our use of traditional designs with sympathetic materials and feature developments ensure comfort and reliability for modern pioneers. Three new tents join the popular six updated tents for 2017. The classic tipi design of the Cherokee and Mohawk sleeps up to six in comfort, with the Mohawk featuring a Rain Safe door for extra convenience. The Prospector captures the spirit of early American pioneers in its frame ridge tent design. tent interiors comfortably cool compared to conventional materials. Will this fit my tent?